Villa Sa Caseta is perfect for larger families or groups of friends wanting a central location, a private swimming pool and wonderful views across the sea to the Illa de l'Aire lighthouse. It only takes 10 minutes to walk down to the beautiful sandy beach which has many good sea-facing restaurants and shops. The villa's 6 bedrooms are split between the main 2 storey house and well-equipped annexe. Free WiFi and air conditioning/heating in the bedrooms are included. The fabulous sea view from the top terrace, plus it's only 10 minutes' walk to the resort centre and beach at Punta Prima! From the main house, a pathway and 9 steps lead past the annexe to the swimming pool, which is surrounded by ample space to sunbathe. Around the back of the annexe is a brick BBQ and a table and chairs for traditional alfresco dining. Large sliding gates open onto the private driveway adjacent to the pool terrace, where there is ample space for up to 3 cars. The driveway leads around to the entrance of the main house, whilst the annexe is accessed from the pool terrace. The combined lounge and dining area are a great relaxing space, with a flat screen TV, comfortable sofas and a table and chairs. Two double patio doors open onto the terrace with steps leading to the pool. The adjacent kitchen is well-equipped, and has a smaller breakfast table. The utility room is accessed externally, by the entrance. On the ground floor is a double bedroom with an en suite WC as well as a separate shower room. On the first floor are 2 single bedrooms and a spacious double bedroom, all sharing the terrace with views over the sea towards the lighthouse. A separate bathroom completes this level. The annexe is positioned in front of the main house by the pool, with its own gated entrance and 3 steps leading to the main door. The lounge, dining space and kitchen are open plan and both the double and twin bedrooms share a separate shower room. A second utility room is adjacent, accessed externally. Villa Sa Caseta is in a great location - a leisurely 10 minute stroll downhill will bring you to the centre of Punta Prima. This popular family resort has a superb white sandy beach and many sea-facing cafes and restaurants with views across to the lighthouse at Illa de l'Aire Island. Splash Waterpark is 5 minutes' drive or 20 minutes' walk away at Biniancolla. Those with a hire car will also be able to enjoy day trips to neighbouring Binibeca as well as the capital, Mahon. There are various mini markets within a short walk from Villa Sa Caseta for all your daily essentials as well as food. You'll also find several gift and beachwear shops in the centre. Punta Prima has a local twice weekly craft market in the summer where local tradespeople set up stalls selling handmade items. The resort has a great selection of restaurants, cafes and bars, most with views over the sea. There's a particularly nice bar set right at the back of the beach, perfect for an evening drink, where you can watch the sun set. The restaurants in the centre offer everything from pizza to fresh fish, meat and tapas dishes. The beach is 10 minutes stroll from the villa. It has a wide area of sand with rocks at either end, perfect for snorkelling. The water is fairly shallow and there are several water sport facilities available, as well as sunbeds and parasols for hire. The beach is overlooked by the lighthouse at Illa de l'Aire (Air island), a popular local landmark. Punta Prima has a good-sized play park with a zip wire, climbing frames, slides, swings and a basketball court. Several of the local hotels also offer evening entertainment which includes mini discos for children. The neighbouring resort, Biniancolla, is home to the island's newest waterpark, Splash, which is 5 minutes away by car, or 20 minutes on foot. The island's capital, Mahon, is easily accessed by local bus if you don't want to drive. The harbour here is definitely worth seeing, you can even take a tour on the glass bottom boat! The waterfront is lined with restaurants overlooking the yachts, and from here you can also wander up to the town and enjoy a day of retail therapy at the chic boutiques or twice weekly market. Other island highlights include the view from Menorca's highest point, Monte Toro, or exploring the cobbled pathways of neighbouring Binibeca. The seafront here is one of the most photographed spots on the island! The islands only 18-hole golf course is located in Son Parc, around 30 minutes' drive away. Keen walkers will love the well-known Cami de Cavalls bridle path which skirts Menorca's entire coast, and connects Punta Prima with the resorts of Binibeca and Alcaufar. The pathway has pleasant scenery over the coast and passes old defence towers and sheltered coves. Villa Sa Caseta is not available to book for season as it is sold out. 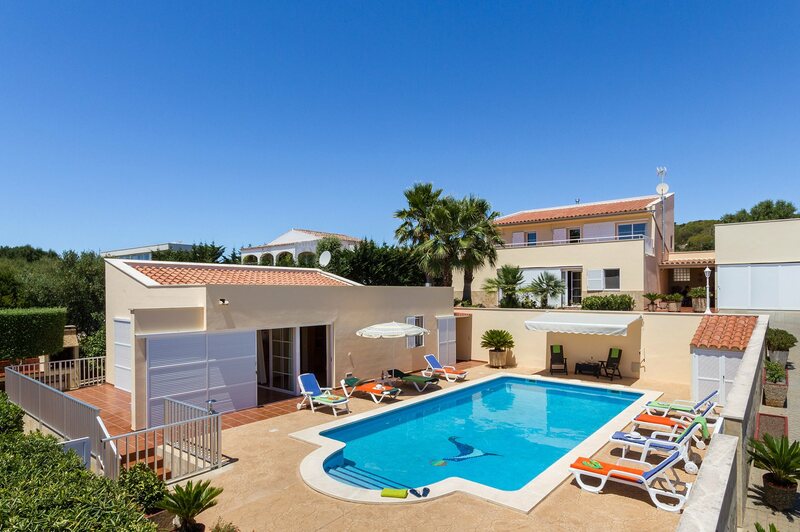 Take a look here at the Menorca villas that are currently on sale. Beautiful,clean and very comfortable villa.